Woohoo! There is now a printable L’Oreal Kids Shampoo Coupon available. 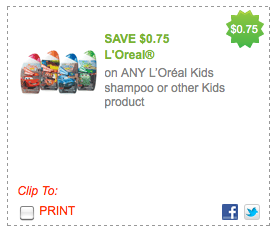 The coupon is for $0.75 off any L’Oreal Kids Shampoo or other Kids Product and was found at zip code: 07039. And, ShopRite shoppers, you all know these will be free at ShopRite this week with the catalina deal. Don’t forget, there is also one in the 6/19 RedPlum insert.